The simplest definition of musical freestyle is a choreographed performance of a dog and handler team that includes tricks and obedience set to music. What this description fails to covey is the endless possibilities, the training relationship built through hours of creating something unique to you and your dog, and the technical aspects in both the training and the production of a freestyle routine. Nor does it convey the sense of community felt between freestylers, a camaraderie that develops within a group of people just outside of the mainstream. Freestyle is a sport of endless possibilities, creatively and in training. While there are no required behaviors or elements in putting together a freestyle routine, titling organizations do provide a written framework for exhibitors to draw inspiration and guidance from. Heelwork is one of the components, as are interesting or novel behaviors, transition behaviors, and focus and engagement — all integrated to create a performance that is pleasing to the eye and expresses the working relationship between a dog and handler team. What you decide to train and put into a routine is entirely up to you. And that can seem overwhelming at times. Because freestyle routines are unique to the dog and handler team that trains and performs them, many new freestylers struggle with what to train. Like other sports, there are foundation skills that are sport specific. In freestyle, those can be harder to pinpoint. And that's where Rally-FrEe comes in. Rally-FrEe is the technical side of freestyle. It provides a structured way for handlers to build their foundation freestyle skills (those skills which will help the dog and handler team create flow and allow for a variety of tricks and behaviors) and their obedience skills. Rally-FrEe was created to help bring a high degree of precision and accuracy to the sport, but also to help teach the freestyler about clear criteria, verbal cues, smooth transitions and how to build skills in a methodical, upward progression. Many of the foundation freestyle and Rally-FrEe skills are similar to those in obedience and the TEAM exercises: Finding positions, pivots, position changes and engagement. If you love training precision heelwork you will never want for something to train! In Freestyle and Rally-FrEe, dogs are worked in both left and right heel, and in front and behind the handler. Dogs learn distance behaviors, backing in all positions in relation to the handler as well as away, and lateral moves or side passes. In freestyle there are 16 different positions in relation to the handler you could train, each with precision and accuracy. Dogs of all ages though specifically younger and older dogs will appreciate that there are minimal sits or stops in Rally-FrEe allowing the dog, through well timed cues and transitions at turns to stay in motion with no abrupt shifts in momentum. This can keep frustration low in younger dogs and easier on the bodies of older dogs. No need to hide your clicker! Positive reinforcement training is the norm in Freestyle and Rally-FrEe. Rally Freestyle Elements (RFE), the governing body for Rally-FrEe, which also conveys titles in freestyle, embraces the philosophy of positive reinforcement and relationship-based training. In both Rally-FrEe and freestyle part of your score is based on "teamwork and engagement and the enjoyment derived from working together". And in keeping with that philosophy, points are never deducted – all points are earned based on what is presented. The freestyle community is unique in their support of not just their dogs, but also of their fellow freestylers. The camaraderie felt at a freestyle show is unlike any other competitive venue. The norm is to applaud, support and celebrate each routine. Newbies are embraced and encouraged. All efforts are rewarded with "Nice work!" and "that was wonderful!" These are heartfelt congratulations. Freestyle brings out an emotional response in handlers and in their audience. It's not unusual to find Kleenex at the judges table and various places around the show site! The motto of the club I belong to is: "Enriching the Lives of our Dogs, Ourselves and Others Through the Sport of Canine Musical Freestyle". Many clubs and individual freestylers perform at public demonstrations or as part of therapy visits, as well as in competitive venues. Along with placements and high score awards, special awards often include categories such as "most connected team", "high score first time in the ring", or to a team that might have over-come some ring challenges. Freestyle is not an easy sport. Just getting to the ring is a worthy accomplishment. Tricksters! We are your people! I won't lie! While freestyle is much more then "just" tricks, novel and creative behaviors are a big part of our training! We love training tricks! And I bet you do too. You might do it for fun, whereas freestylers get to do it all the time! 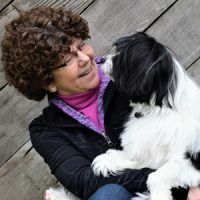 Through the training of novel and complex tricks and behaviors handlers can broaden and strengthen their skills while expanding their dog's repertoire and continued learning. In freestyle and Rally-FrEe the dog has a say in what or how to perform some behaviors, making it a truly cooperative process. Many of the behaviors trained in freestyle and Rally-FrEe also benefit the dog physically, creating body and rear end awareness, flexibility and core strength. There is greater symmetry in muscle use and development from working on both sides of the handler and moving in all directions. Proprioception is greatly enhanced in freestyle dogs. This combination means that you will see virtually no injuries in training for freestyle and Rally-FrEe and the strength and flexibility from cross-training in these sports can mean fewer injuries in other sports. So if you are looking for a Challenge, want to really hone your training skills or just want to add some fun and variety to your training, you might explore the sports or freestyle and Rally-FrEe! Interested in Freestyle or Rally-FrEe? Julie is currently offering a workshop series (with workshops starting 3/19, 4/23 & 6/5) on learning key freestyle behaviors or you can check out her upcoming class for the April session, Rally-FrEe and Musical Freestyle Foundation Skills 1.